Among those taking the stand Aug. 26 after the highly competitive, two-day 2018 CPHA Foundation Equitation Championships were the 22-over top three trio. 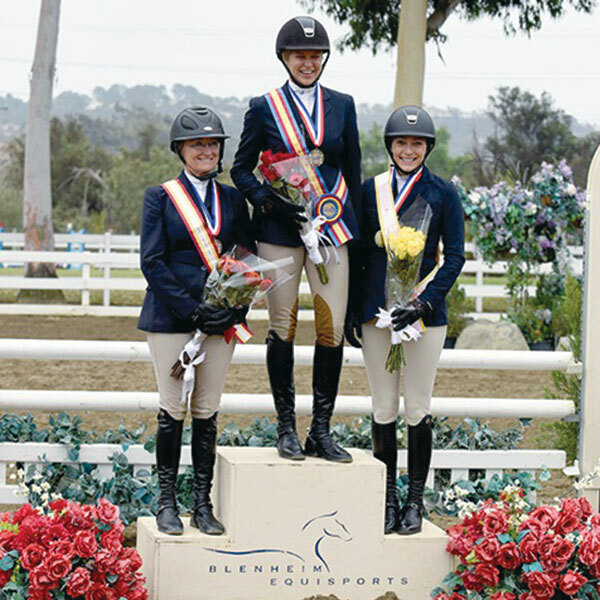 DEL MAR—As summer fades to a close, 119 equestrians in three age sections hit the books—the USEF Rule Book, that is—to practice the equitation tests that are uniquely built into the two rounds of the California Professional Horsemen’s Association Foundation Equitation Championships. Those who had put in extra hours with the counter-canter had an edge throughout the Championships, held Aug. 25-26, at the Showpark Summer Classic at the Del Mar Horse Park. With more than 50 starters, the 21-under division was the biggest of three. Designed to be more of a jumper-oriented test than the 14-under and 22-over divisions, the 21-under was held on the expansive grass Grand Prix field and included a liverpool. However, the courses used by the other two age groups in the smaller sand arena were no less demanding. For the 22-over and 14-under sections in the sand arena, tests included a halt-and-counter canter on the first day and on Day 2 a set number of strides from fences 2 to 3, as well as a counter canter on a left bend from a Swedish oxer to a grass-draped vertical option towards the end of the 3’3” course. There were no instructions on how to get the counter-canters, and various interpretations were seen. Judges rewarded those who pulled off landing on and holding the counter canter. Consistency paid off for Jaime Krupnick aboard Conux. Her 83 and 82 scores from Saturday and Sunday put her first in the 22-over four-pair work-off, which she nailed for an 85. With scores of 81 and 82, 13-year-old Stella Buckingham was sitting second going into the work-off. She and Nom De Guerre were smooth and efficient with the two lead changes the judges had requested as the work-off’s finish. She recorded an 84 score to secure the win in the 14-under section. Finishing the day, 16-year-old Sophia Sanders and Cipriani logged one of their biggest victories yet, thanks to 85.5 and 88 initial rounds and a commanding 88 score in the work-off for the victory in the 21-under section. Krupnick, a mother and busy business-owner, has a full plate to keep riding at a top level since she returned to the sport two years ago, after an 18-year hiatus. Riding Georgy Maskrey-Segesman’s Conux, Krupnick relished the challenging questions asked. Precise riding made the most of Conux’s adjustability, resulting in consistently smooth efforts. “The best part for me was the counter-canter, Conux said. “My goal was to land on the right lead and hold it. Referring to the Round 2 test, champion Stella Buckingham had a plan. “I was most nervous for the counter canter,” she said. Stella Wasserman was a close contender with a two-round average of 80.25 that was boosted by an 84 work-off to earn the Reserve Championship aboard Skyhawk. During the intervening month, the Northern California rider, who trains with Patty Ball, emphasized balancing exercises, especially counter canter and tight turns. “It paid off,” she said. Winner Jaime Krupnick applauded the compeition. “The CPHA always does such a great job: the nicest finals and the nicest awards.” Much appreciated sponsors are a big factor, these include DaMoors Tack & Feed, Outdoor Outfitters, James Klein Insurance and Great American Insurance.